When I first started collecting Whiskey I wasn’t quite sure how I should store the bottles or how to serve drinks. I knew I didn’t want my apartment to look like a frat house or for visitors to think I was an alcoholic but I was also really proud of my small but budding collection. Luckily old movies and shows like Mad Men really helped point me in the right direction. Below are some purchase suggestions to help you share your love for Whiskey, Bourbon or Scotch all while looking like the classy gentleman that you are. 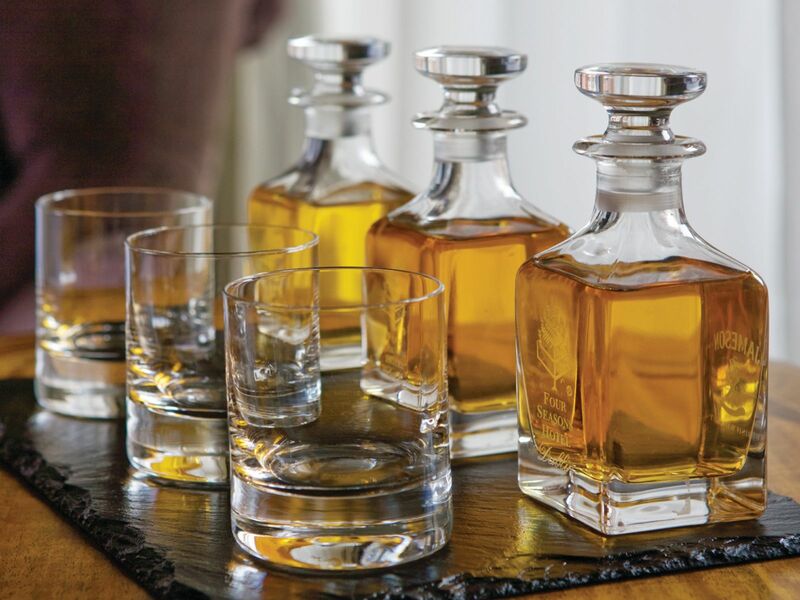 A good decanter can go a long way in making your collection look like a million bucks. You can find them at vintage stores, flee markets or Amazon makes it really easy to find the perfect one that suits you. While I suggest getting crystal it isn’t absolutely necessary. My first and only decanter was an Italian made Excalibur that I found here. It looks like it now comes with 4 Old Fashioned glasses, which is a great deal and an another item that should be on your list. While I’m sure some Whiskey aficionados are cringing at the word “ice” I still enjoy a cube or two with some higher-proof Bourbons and if I have guests that don’t drink Whiskey regularly chances are a piece of ice will “help the medicine go down” if you will. While it’s your preference in regards to style, I think it looks the best to match your bucket to your Whiskey Decanter so I chose a mini glass version made by Bormioli Rocco Moncayo which came with serving tongs for only $11 bucks. Although the red plastic cups you see at parties are economical and great for a game of flip cup they just aren’t appropriate to serve the delicious bottle of Whiskey you proudly brought home from the store. I prefer a good rocks glass that can be found pretty much anywhere (much like the set that comes with the decanter mentioned earlier). Now if you were doing a tasting for yourself or friends and family, I would highly recommend a Glencairn Crystal Whiskey Tasting Glass. These are quality glasses and the shape really helps you identify nuances (smell, color, legs) of what you’re trying, dramatically improving the experience. For those who are anti-ice, these non-porous Soapstones are a good way to chill your drink without watering it down. I don’t use them but do have a set for guests if they prefer. I recently ran across this set from Whiskey Disks, which seemed interesting but I haven’t tried them. After a visit to Barrel 44 one evening, I knew I had to find the giant ice cubes they used for the drinks served on the rocks. They were perfect 2” square ice cubes that melted extremely slow due to their surface area. Aside from the benefits of a slower melt rate I enjoy the novelty of the giant cube. After a long time searching the web I finally found them here. In summary there are a lot of classy and inexpensive ways to make your Whiskey collection look great and still showcase your love for this refined spirit. I could go on forever discussing items I still want to add to my collection (serving carts / trays, etc.) but the items listed above should be more than enough to get your started. Be cautious with the old decanters, especially crystal. These decanters often contain lead which will leech into the whisky over time. The amount of time in a glass for drinking is absolutely ok, but long term storage/display in a leaded decanter can be deleterious to the whisky and your health. Hi- I bought my husband a set of nice glasses a year ago ($50 for 2). New Xmas gift this year will be a decanter- Do you think it is necessary to also buy the matching decanter? It’s a round shape but I think he may enjoy the square shape more. Thoughts? Or does it not need to match?